United Way of Volusia-Flagler Counties offeres two unique prescription savings programs to help families and individuals save money on their prescriptions, vision, dental and more! While you can only use one card per prescription, ask your pharmacist to check both as they offer different discounts. There is no application or paperwork to complete. There are no income or age requirements and everyone can be covered. All information is confidential and will not be shared. NOTE: If you or your company needs pre-printed cards for distribution, please contact us and we can have those ready for your pickup and/or delivery. 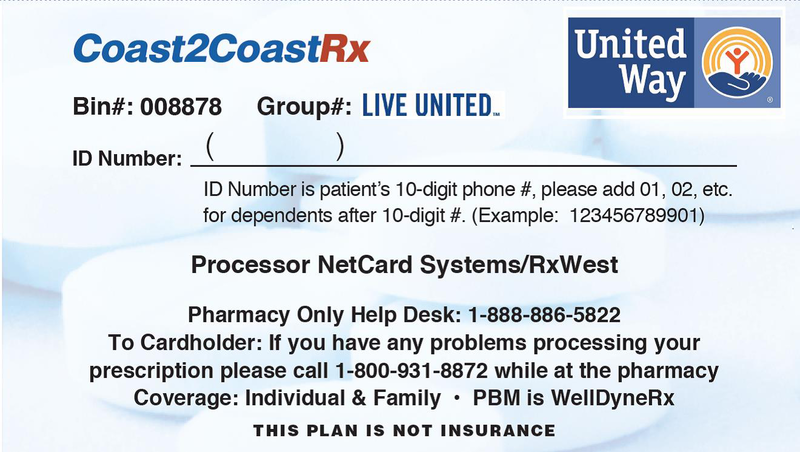 In 2013, United Ways in Florida partnered with Coast2Coast Rx Card to offer Floridians even more prescription savings options. Coast2Coast expands coverage to include: dental, vision, veterinarian, and more. Find out more about Coast2Coast Rx Card. United Ways have been partnering with FamilyWize since 2005 to help local communities save on their prescription needs. FamilyWize is making a HUGE difference in our community with claims from UWVFC being in the Top 20 of ALL United Ways! Find out more and download your card.